I still remember the first time my pastor-husband came home from a beyond-difficult day at work and shared with me about the horrendous attack on his character that he had suffered. I’ll not bother to tell you what church we were serving at that time. It really doesn’t matter. It could have been any of the five, honestly. And it could have happened at thousands of others as well. The church in general is not easy on its pastors. The kicker was that a man in the church had accused my husband of “cussing him out” in a private meeting between the two of them. Y’all. My husband didn’t let our children say, “gosh.” He’s never used words that even most Christian families use to describe bodily functions and waste. He doesn’t say, “darn.” He doesn’t even raise his voice or use derogatory or hateful words when the two of us are having an argument and I’m ranting and raving and slamming doors and screaming like a wild banshee. He stays calm and polite and frustratingly godly. He does not cuss. End of story. So when he told me that he’d been accused of cussing this guy out, I just laughed. Then I didn’t any more. Then I got stark raving mad. How dare somebody accuse my husband of something he could not have possibly have done and tarnish his reputation like that! I wanted to know what James was going to do about this. I began to coach him and prod him and suggest cutting remarks he could use to put this guy in his place. But James would have none of that. Well, that didn’t set too well with me. Surely God would expect James to do his part. Surely he should at least get on the phone and drum up some support, tell his side of the story to others as a preventative measure and all. “Nope.” James calmly assured me that he would not defend himself. Ever. He would not fight back. Ever. (I will confess that this was early in our ministry. So I leaked that.) And in all these 29 years of ministry, he has not…ever. Has your character been questioned or tarnished? Maybe someone has slandered your good name, gossiped about things of which they don’t know the whole story, questioned your motives unfairly, assumed the worst or even maliciously attacked and accused you. I’m so sorry. I know how that feels. And I know how frustrating it is. Honestly, it makes me want to scratch somebody’s eyeballs out!!! It’s just fiendish. And certainly not godly, not Christlike, not loving…no matter how they rationalize it. But here’s what I’ve learned from my dear husband over the years. The Lord is a trustworthy, capable, powerful and just defender. His timing is impeccable. His motives are always pure and holy. His ways are just. His protection is sufficient and always available. Do you trust God to defend you when others unjustly attack you or malign your character? Or worst perhaps, the character of your loved one? It’s not easy, is it? It isn’t for me. I feel like that spitting mad little kid who’s just chomping at the bit to take on the big bad bully, flailing my puny arms, kicking up dust, shouting threats…”Let me at’em! Let me at’em! I’ll giv’m what for!”…while the wise, strong and gentle-spirited Daddy places his strong hand firmly but lovingly on my shoulders and holds me back for my own good. Praise You, Lord, for gentle but firm restraint! When my character is maligned or my husband’s reputation is slandered or my child’s integrity is questioned or my daddy is accused falsely? What’s a godly gal to do? Actually, I asked our Father this question just recently. In not so gentle a tone, mind you. And I didn’t hear a voice or read anything on a wall. But I did sense Him impress upon my spirit this gracious and sustaining truth. This is biblical, and I’ll give you verses to back it up. I’m not adding to scripture or going whackadoodle on you here. But I felt like God issued these directions to me in such a way that I could easily articulate it to others and so I could preach it to myself over and over again, multiple times every day. You see, the Holy Spirit whispered that to me just recently, but my husband has lived that out for the 31 years I’ve known him. It’s not just that he doesn’t defend himself but allows God to do that. More importantly James continues to demonstrate godly character in the midst of the fire and the storm. And that, sweet wounded sister, is our responsibility, too. When we have been slandered or maligned or questioned with suspicion or falsely represented or unfairly judged, we are not to fight back or set straight or go out swinging. That means I speak grace filled words rather than bite back. I remain humble rather than bow up. I give the benefit of the doubt even when others don’t. I listen more than I speak. I hold back words if the ones coming to the surface are harsh. I beg God over and over to soften my heart where I feel it growing hard. And I yield to His will…because His ways are not mine, but they are always good. If you have been wounded and your character has been questioned, you certainly may need and are due a time of healing. My 10-Day Prayer Journal for the Wounded Heart is based on Psalm 27, as mentioned above in this post. Many have found that praying through this Psalm brings spiritual healing that begins a journey in the right direction. You can find out more and subscribe to this free daily prayer journal here. Stand Firm, Kay, others are standing in the gap for you both. Thank you, sweet Michelle. We appreciate you and your family so much. Blessings to you all! This post touched me so much because it’s something I’ve been dealing with my entire life. I don’t know why, but people always seem to think either the worst of me, or something completely untrue/. Even if I try to defend myself, they insist they are right about me and “know my heart” or true intentions. It hurts unbearably and it drives me crazy. I’ve learned I can never change someone’s opinion of me, all I can do is always think the best of others, no matter what. Thanks for reading and commenting, Amy. I’m so sorry that I just found the request for approval for this comment. I apologize for the delay. I’m glad this post spoke to you. It sounds like God has already been teaching you in this area and just used this post to confirm what you were already learning. Blessings to you! Kay, I “spoke” with you pn First 5. I hope I’m subsribing the correct way as I usually do this type thing on e-mail. 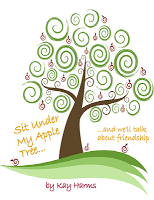 Sign up to receive my blog posts by email and you can download my e-book Sit Under My Apple Tree for free! Make sure you confirm your subscription when you receive the email from MailChimp.